A Proton-M rocket is slated to launch a communications satellite for Intelsat on Wednesday, June 8, to expand the company’s fleet of commsats. The spacecraft, named Intelsat 31 (also known as DLA-2) will take to the skies at 3:10 a.m. EDT (7:10 GMT) from the Launch Pad 24 at the Baikonur Cosmodrome in Kazakhstan. The nearly 6.5-metric-ton satellite was built by Space Systems Loral (SSL). It was designed to provide Direct-to-Home (DTH) television service in Latin America. Although the satellite will be operated by Intelsat, the company will lease the complete Ku-band capacity of the spacecraft to DirecTV Latin America, a DTH digital television services operator in Latin America. Intelsat 31 is based on the proven SSL 1300 platform, present on the space industry market since mid-1980s. This bus has a total satellite power capability ranging from 5 to 25 kW and can support from 12 to 150 transponders. According to SSL, this platform features a lightweight and high-strength structure, fuel-efficient attitude and station-keeping subsystems, high-efficiency and reliable solar arrays and batteries, and advanced command and control subsystems. Intelsat 31 is fitted with 10 C- and 72 Ku-band transponders. The satellite has two deployable solar arrays capable of generating 20 kW of output power, throughout its designed lifetime of 15 years. The spacecraft will be inserted into a geosynchronous orbit and will reside co-located with Intelsat’s Galaxy 3C and Intelsat 30 satellites at 95 degrees West. It will be used for high definition programming throughout Spanish-speaking South American and the Caribbean. Intelsat hopes that using spot-beam frequency reuse and the industry’s best technologies, the Ku-band payloads will greatly expand DTH entertainment offerings in Latin America and provide backup and restoration services. The satellite was shipped to Baikonur in late April 2016. The extensive testing campaign was carried out throughout May and by the end of the month the spacecraft was attached to the rocket’s Briz-M upper stage and encapsulated in the payload fairing. The fully assembled Proton-M was rolled out to the launch pad on June 5 in the morning hours. “Spectacular sunrise, warm temperatures, slight breeze provided an outstanding start to the day as members of our team along with a multitude of Russian colleagues spanning multiple organizations (it takes a village to launch a rocket) watched in animated anticipation, awe and with a great deal of pride as the Intelsat 31 cocooned in the mighty Proton Rocket rolled out from the Briz-M fueling station at 6:30 today bound for Launch Pad 24,” International Launch Services, a company that will manage the launch activities, said in a blog post. The launch of the mission was initially planned for May 28, but was delayed due to an issue with the upper stage’s thermal control system. Proton-M is currently standing at the launch pad in a vertical position awaiting its liftoff. According to Intelsat, the teams are ready for Wednesday’s blastoff. “All systems are go for the launch of Intelsat 31 on Wednesday, June 8. Those of us on site at the Cosmodrome have been working for several days now on the combined operations,” Intelsat wrote in a blog entry. After liftoff, the rocket is expected to complete a relatively long flight lasting approximately 15 and a half hours, ending in spacecraft separation. In comparison, a usual commercial mission tasked with orbiting a communications satellite hardly ever takes more than three hours to achieve an orbital insertion. 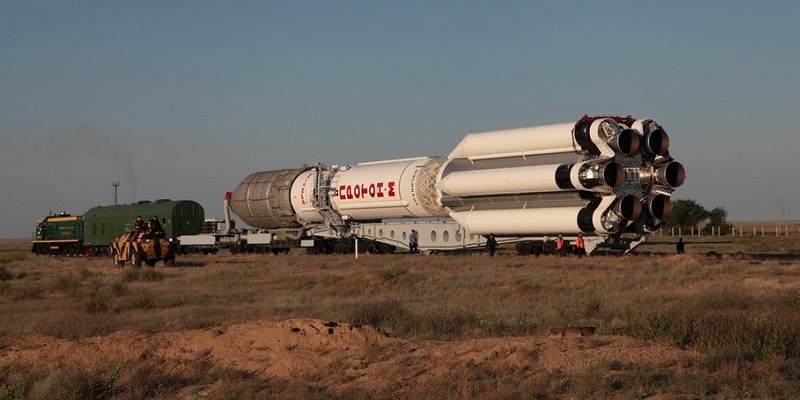 The 190-foot tall (58-meter) Proton-M booster, which will be used to send Intelsat 31 into space, measures 13.5 feet (4.1 meters) in diameter along its second and third stages, with a first stage that has a diameter of 24.3 feet (7.4 meters). The total overall height of the Proton booster’s three stages is some 138.8 feet (42.3 meters). The rocket’s first stage consists of a central tank containing the oxidizer surrounded by six outboard fuel tanks. Each fuel tank also carries one of the six RD‑276 engines that provide power for the first stage. The cylindrical second stage is powered by three RD-0210 engines along with a single RD‑0211 engine. Meanwhile, the third stage is powered by a single RD-0213 engine and a four-nozzle vernier engine. Guidance, navigation, and control of the Proton-M during operation of the first three stages is carried out by a triple redundant closed-loop digital avionics system mounted in the Proton’s third stage. The Briz-M is powered by a pump-fed gimbaled main engine. This stage is composed of a central core and an auxiliary propellant tank that is jettisoned in flight following the depletion of the stage’s propellant. The Briz-M control system includes an onboard computer, a three-axis gyro stabilized platform, and a navigation system. Wednesday’s launch will be the third Proton mission and the 14th orbital flight for Russia in 2016. It is also the 93rd ILS Proton launch overall. Next Russian mission is currently scheduled for July 8m when a Soyuz-MS spacecraft is expected to send a trio of Expedition 48 crew members to the International Space Station. This must be an exciting time for Latin America Television watches and I wish the launch team the best of luck, for a successful mission.